I find the two outfits above have a very "earthy/boho" kinda look to them. I think this outfit is really pretty. The colours work well together and even though it's not one of those really bright in-your-face outfits, the use of gold adds a hint of sparkle and make this outfit shine from afar. 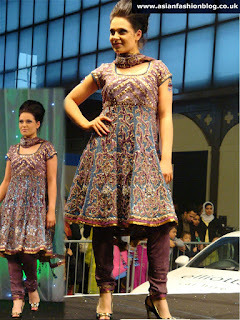 I went to Anjali's Boutique in Manchester just before she moved and it was amazing! The outifts are so different to asian clothes I have seen before. The styles, fabrics and colours are very bohemian and chic, bringing asian fashion right into the 21st century.. they stock clothes you would expect to grace the runways of fashion week! Its Anjali here from 'Anjalis Boutique'. My business has now relocated to 451 Victoria Road. Glasgow. G42 8RW. Tel: 0141 433 4343. 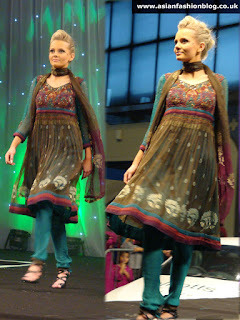 My Spring/Summer 2010 collection is being showcased at the Hilton (William Street) Glasgow on 7th Feb 2010.